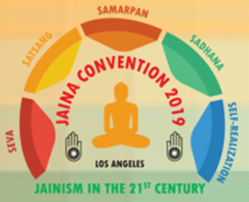 We are pleased to inform that the JAINA Convention 2019 Board Members will be visiting JSMC on February 17th for a town hall meeting. Here is your chance to know more about the convention, get an overview of on going preparations and information on how you can take part in the efforts to make this convention a big success. Join us on February 17th from 1:00 PM to meet the convention board. JSMC Thanks JAINA Convention Board for sponsoring Afternoon Swamivatsalya on Feb 17th. For more information please contact our JAINA Directors Atul Shah, Hitesh R. Shah and Hemant Shah.